Dunkin' Donuts announced in a press release today that it has struck a deal with Rachael Ray. She will serve as the donut and coffee shop's "brand representative" and will "appear in a multi-platform marketing campaign for Dunkin' Donuts." Dunkin' Donuts also says that Rachael will "lend her perspective to the Dunkin' Donuts culinary team in the development of new, 'better for you' food and beverage options." These options include smoothies, Latte Lite and reduced carb bagels (they should be whole grain, not reduced carb, but whatever). The campaign will run through 2010 and will include ads featuring Rachael via television, print, radio spots, online, in-store marketing and personal appearances. The first television spot is scheduled to air in April and the campaign will run through 2010. I probably won't see too much of this stuff out here in California, since we don't have Dunkin' Donuts (that I know of). In fact, I think I've only been to DD once, when we went to Ohio last summer. "We believe there is tremendous synergy between Dunkin' Donuts and Rachael Ray," said Robert Rodriguez, Dunkin' Donuts brand president. "Rachael's philosophy of creating quality meals quickly and without pretense for busy people living busy lives is the same driving force behind the Dunkin' Donuts brand." "Everyone always asks me how I manage my schedule, and the answer is coffee," said Ray. 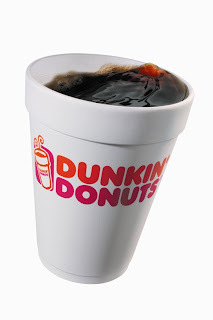 "Having grown up in the Northeast, I have a long-standing and deep appreciation for Dunkin' Donuts' coffee. In addition, I am excited to work with Dunkin' Donuts' team of chefs as they expand their menu to include new items for customers looking for more health-conscious options." Thanks to the wonders of the internet, I learned that the closest Dunkin' Donuts is 800 miles away in Phoenix, Arizona. So, I don't think I will be able to support Rachael's latest endeavor. You guys will just have to have a donut and a coffee for me when you go! Madeline - my best friend moved to LA a few years ago and DD was one of the few things she missed from Pittsburgh! BTW - have a great trip to Europe - I'm jealous! Their commercial jingle is "Dunkin Donuts...it's worth the trip". So maybe Phoenix isn't so far away. Also, in a recent large consumer taste test of coffees from various stores and outlets, DD was tops for their category. I have to say I was impressed by the coffee. I think I had some sort of bagel sandwich that was good, too! I love Rachael Ray, she has helped me to improve my cooking skills so much, that my husband loves her show. Thank u Rachael Ray.